You'll forgive me for indulging in what is essentially pure nostalgia this week and reviewing a book I hadn't thought of in years, but which had a profound impact on me as a young girl. I was remembering the school I attended in fifth grade the other night and mentally wandering the halls and rooms. I remembered the wonderful library it had and the kind librarian there who listened to me talk about how much I loved Lloyd Alexander and Susan Cooper and, smiling, led me over to wonderful, new authors such as Madeleine L'Engle. It was in this library that I was perusing one day when I came across Good-bye Pink Pig by C.S. Adler. I know. Can you believe that title? And the picture to go with it. I mean, look at the sadness in that little girl's eyes. They almost look without hope completely. I hadn't even entered my hopeless junior high years yet, but for some reason it called out to me. I'd read a fair amount of children's and young adult fantasy by this point, but I'd never really read a contemporary fantasy, let alone one that might actually have just been the sad dreamings in a little girl's head and not real at all. That ambiguity intrigued me and I fell utterly under this relatively unknown, wistful little novel's spell. Ten-year-old Amanda walks around feeling like the world's biggest disappointment. Her beautiful, cultured mother doesn't know what to do with her shy and unremarkable daughter. Her big brother Dale is kind to her and watches out for her, but their relationship is all but eclipsed by their mother's expectations for Dale regarding going to an Ivy League school and putting that special shine to the family name. Her best friend Libby has always been a source of comfort, but things begin to shift when Amanda discovers a tiny, glass pink pig to add to her collection of miniatures. Pink Pig is different from her other toys. He's real. When she plays with pink pig, she's transported from her dull daily life to a world where all her miniatures live and are real. It's during these times, and only during these times, that Amanda feels alive and loved. But no one will believe her when she tells them about Pink Pig. No one but her grandmother Pearly, who works as a janitor at the school Amanda attends, and who her mother tries to keep her from seeing as a rule. Embarrassed by her ex-husband's working class mother, Amanda's mother does everything in her power to keep the two separate. But when Pink Pig is lost, Pearly is the only one Amanda can turn to to fend off the bone crushing loneliness that threatens to engulf her. Even now, years later, I get a little thrill of happiness thinking about this sweet, sad story and how much I understood (despite not sharing Amanda's bleak circumstances) the loneliness she felt and the longing for beauty and magic to balance the grim. It's a beautiful book and it made me both long for an older brother like Dale and feel profoundly grateful to have two loving parents in the place of one high strung and completely clueless mother. It reminded me very much of watching The Neverending Story. As I said, this book resides somewhere between fantasy and contemporary fiction and I remember thoughtfully trying to decide which I really wanted it to be. I was 10 myself when I read it and, like Amanda, I felt caught between the two worlds, wondering if it would be so bad if the magic were all in her head, reluctant to let it slip out of my fingers, and curious at how well she would handle moving on with her life. I was very proud of her in the end. And thoroughly pleased with the result. Curiously, I believe C.S. Adler actually wrote a sequel to this book, but I never felt the urge to read it as this one just didn't need a coda of any kind as far as I was concerned. I'd love to talk to someone else who's read it more recently and hear how it holds up over time. In my memory, it's preserved perfect and clear, like the glass of each little figurine on Amanda's shelf. I like the cover of this one, it's so retro-fab! 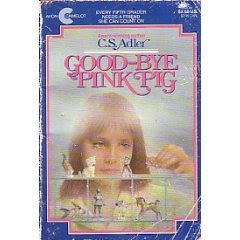 Also, I have never ever heard of Goodbye Pink Pig, but it is totes on my radar, so if I ever see it at a library book sale, you better believe I am going to snap it up! Hey, I just did my own first Retro Friday review! Hopefully you don't mind if I'm doing it on older books I've read for the first time :) Love these! Here's my review. Your Pink Pig book sounds rather lovely--I shall look for it! Oh my gosh!! I've been searching for this book for years! I read it when I was young and all I could remember was that it had animal miniatures as part of the central plot and on the cover. I thought I'd never figure out the book. Thank you!! I completely remember this book from Mrs. Sisson's shelf in 6th grade! The girl does look soooo sad. I wonder if any kids are still reading it today? Oh my gosh, I remember this one too! I remember I asked for miniatures for my birthday after reading it. I think I even got a pig. Oh my, look at that title! The cover looks so old school, it's a great choice for Retro Friday. It sounds like the perfect read for a little girl but it looks like it's out of print? Oh! That book sounds just amazing. When I was a small girl, I used to live in my head a lot, so I can completely understand how Amanda felt. *Sigh* I'm going to try to find this book, sounds like the kind of thing I will just love.